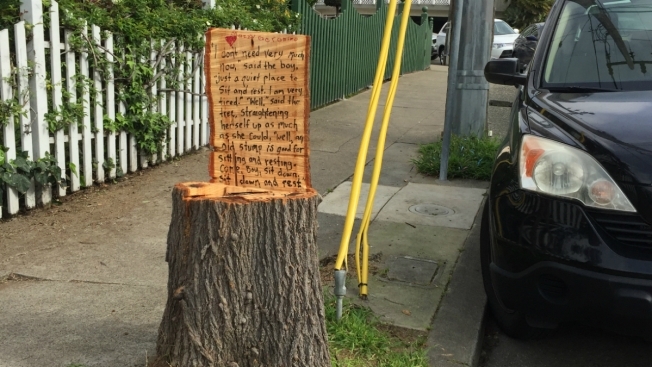 The closing lines of Shel Silverstein's bittersweet children's classic, "The Giving Tree," brought fame — on the Internet at least — to a lowly tree stump near Oakland's Lake Merritt. Elizabeth Geronimo, the homeowner who cut down the tree to make the literary stump, said Thursday it was her husband's idea to write the lines. She and her husband Vince Geronimo hired a family friend who is trying to start a tree trimming business to do the work. He left the stump in the shape of a chair. 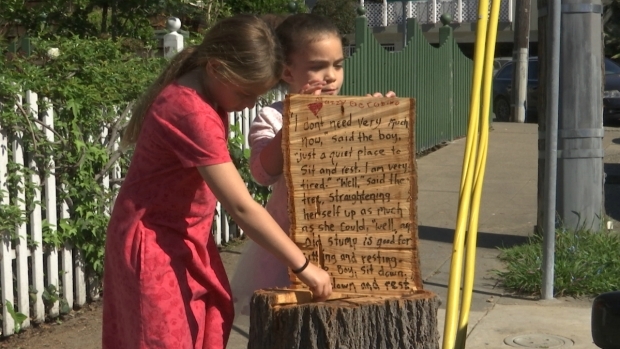 When the Geronimo family wrote a few lines from Shel Silverstein's "The Giving Tree" on a freshly-cut tree stump beside the sidewalk, they never imagined it would become a viral sensation. "It was my husband's brain child," she said. "I just dug up the book. I've always loved that story." Her children, 8-year-old Mazzy, and 11-year-old Marrs, were delighted. Marrs said the book was her favorite for a long time, but now she reads longer books. Her mother sometimes gets weep when she reads it, which she doesn't quite understand. Elizabeth Geronimo speculated that the stump resonated because the book is meaningful to so many people with many interpretations. Published in 1964, the book's simple language was a staple of many childhood readers. Seeing the words on the wood send many on an instant nostalgia trip. Passersby smiled and took cell phone photos of the tree. No matter how old, it didn't take much to get people talking about the people who read to them — parents, aunts, teachers — and those who gave selflessly like the tree. On another level, the book is a parable of parenthood and aging, desire and loss. "I was trying to tell my daughter, 'See, it's about parenthood!' She's like, 'No Mom, it's about a tree," Geronimo said. "I think it's about giving everything. It makes you happy, but sometimes it's a little hard." The stump's 15 minutes of fame have made her children happy, but caught the family a little off guard, Geronimo said, explaining that her husband was on a business trip and wasn't available to explain exactly what inspired him to quote the book in marker on the stump. The stump became the subject of a popular thread on Reddit and got written up in the New York Times' California Today email newsletter. "It's just marker on a stump, but that book means something to people," she said. "It's all been a little surreal. But apparently we're famous on the Internet."